Joins Renegade Sprints as series director. 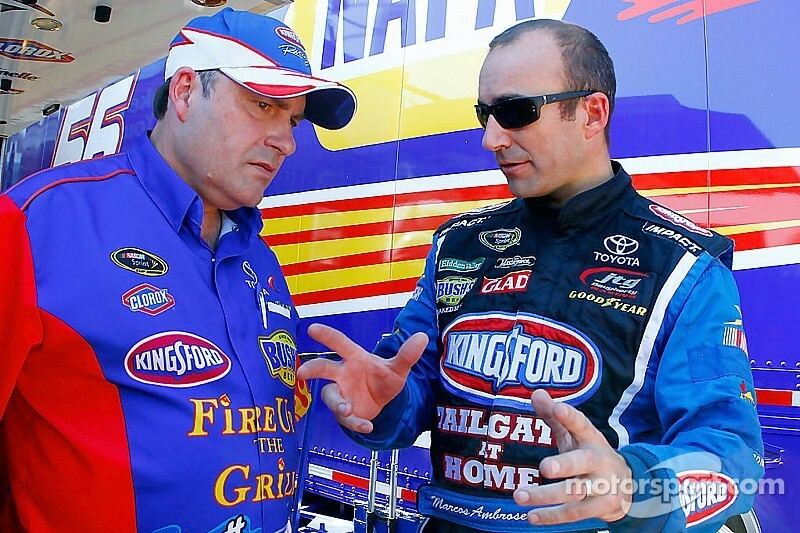 The Renegade Sprints series has hired Frankie Kerr, the NASCAR crew chief for a variety of drivers including Marcos Ambrose (with Kerr in photo) as the series director. Kerr drove to numerous sprint car series and track championships in Ohio along with five Ohio Speedweek titles before spending the past 15 years in the NASCAR industry. "My love is still dirt racing," he said. "I've always wanted to get back to dirt and help racers. The heart of sprint car racing for the most part is in the central part of the United States - Ohio, Indiana, Illinois and Pennsylvania. We're going to be a series that will grow." Kerr will handle the competition director duties on race day along with other aspects of growing the series, such as scheduling races, enforcing rules, securing sponsorships, etc. Renegade Sprints President Shane Helms will remain as one of the series officers. "All along the plan was to find the right guy for the job," Helms said. "I believe Frankie is that guy. He has a great reputation and a lot of contacts in racing. I'm happy to turn things over to him as the series continues to build momentum." Kerr's most recent job has been as a crew chief for several top-notch drivers in NASCAR, including Ambrose, Robby Gordon and Bobby Labonte to name a few. That career path came on the heels of a standout sprint car career that ended abruptly following two decades behind the wheel. "I won on a Tuesday night at Fremont Speedway (in Fremont, Ohio) and I retired the next day in the middle of Speedweek," he said. "Don't ask me why, but it just happened to turn out that way. I don't regret it because I've made a really good living for my family, but I still have that passion for dirt racing.